Freemasonry is a voluntary organization promoting a way of life that binds men together in a worldwide brotherhood. 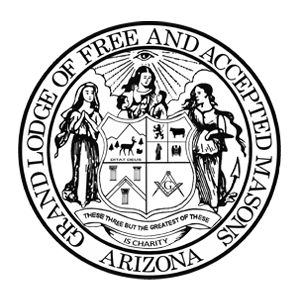 It transcends all religious, ethnic, cultural, social and educational differences in order to promote positive changes in Arizona Freemasonry and the world. We strive to make good men better men. 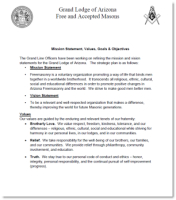 To be a relevant and well-respected organization that makes a difference, thereby improving the world for future Masonic generations. Brotherly Love. We value respect, freedom, kindness, tolerance, and our differences – religious, ethnic, cultural, social and educational while striving for harmony in our personal lives, in our lodges, and in our communities. Relief. We take responsibility for the well-being of our brothers, our families, and our communities. We provide relief through philanthropy, community involvement, and education. Truth. We stay true to our personal code of conduct and ethics – honor, integrity, personal responsibility, and the continual pursuit of self-improvement (progress).